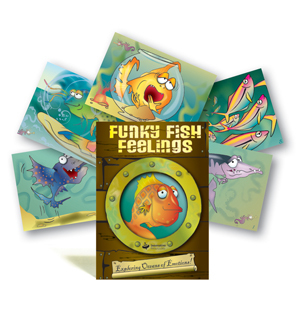 Fabulous fish characters for helping you to describe feelings! ‘Kate is 11 years old and has come from a very traumatic background. Since entering Foster Care three years ago, she has had 17 different placements ranging from placements with family members, Home Based Care placements and Residential Care placements. She struggles to articulate her emotions and regulate herself, which becomes challenging when she is trying to express how and what is making her feel the way she does. 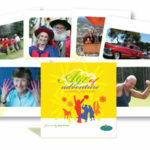 I have been working with Kate a lot, using a variety of card sets every week for different activities. We use the Ups and Downs cards, Cars ‘R’ Us and The Bears. We use them to talk about ‘highlights of the day’ and how we are feeling, and explore what happens when we trust people and what trust looks like, how we can feel safe, and create a plan or set goals for the next week. Her range of emotions is extremely limited. 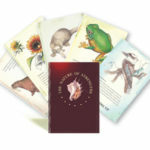 However, the cards prompt Kate to expand her capacity to express herself and encourage Kate’s primary carers to assist her in working through challenges that arise. I suggested the Funky Fish Feelings cards after a discussion with Kate about the possibility of her having her own set of cards, which she could use with her carers at any time. Kate enjoys craft activities, sport, drawing, playing games on her Nintendo DS, playing guitar and dancing. She is very artistic and I thought Funky Fish Feelings would be excellent and appeal to her. Plus, they would be a different type of card set from the ones we use in our sessions—they would be special and specific to her home environment. Phalen Taylor, Family Worker, St Luke’s Anglicare. In an era when health and welfare organisations are notoriously risk-averse, Emily McVeigh’s Ballarat-based centre, Equine Learning Experiences Australia (ELEA), has been busting the trend with some remarkable results. On paper, the idea of placing vulnerable individuals in close proximity to 500kg of solid horseflesh would usually send a shudder down the spine of CEOs and program managers. But ELEA, in fact, is thriving with the support of therapists, psychologists, schools and disability services, who are seeing firsthand the life-changing outcomes of Emily’s programs. Innovative Resources’ card sets are used in a number of ways to complement equine therapy processes. In her work with autistic children, Emily has found Funky Fish Feelings to be particularly effective. Emily sees an ongoing role for Innovative Resources’ card sets and is keen to keep experimenting with them. Flimsy cards and hunky horses may seem an unlikely combination. But for those of her clients who struggle with naming and verbalising feelings, the cards are just the ticket for putting emotions back into very human terms.